A terrific addition to any kitchen counter or breakfast island, this beautiful Monarch Specialties backless bar stool combines top-notch design and durability for a truly timeless piece. You'll appreciate how well its contemporary design fits into any room in your home. Its silver base frame gives a stylish flair to this piece, surprisingly easy to match with other decor. Built from heavy-duty steel, the stool has a stationary seat and multiple footrests for added comfort. This galvanized silver metal finish will brighten any room, allowing it to easily coordinate with your existing decor. Perfect for pulling up to a counter, bar, or high top table. Arrives fully assembled. Add some sophistication and class to your kitchen with this classically styled barstool from CorLiving. The easy to clean padded seat is offered in matte dark brown bonded leather and swivels smoothly on a durable high quality bearing plate. Decorative brass finishing nails are a perfect complement to the bonded leather seat. Frame constructed of high strength steel with hidden plastic floor protectors to provide a sturdy base. Your guests will be sure to admire the classic design and luxurious comfort of this charming barstool! Style your home with these inviting barstools from the CorLiving Collection, providing the perfect way to relax at a 33"- 36" counter height. Easy to wipe clean, the DAD-818-B is upholstered in tough white bonded leather with a beautiful metal studding detail on the backrest. This pair of barstools feature upholstered contoured foam, sturdy hardwood legs finished in a Dark Espresso stain, and a stylish chrome footrest. The uniquely shaped high back design will add style to your kitchen, bar or dining room and compliment a warm transitional design. Sold as a set of 2 these barstools offer great value and will make the most of your entertaining space. This set of two 24 inch high barstools in a white finish is a perfect addition for kitchens, game room or for extra seating when company arrives. With a comfortable saddle seat and well positioned footrest, these classic counter height stools will be the staple of many memorable evenings with friends and family. Add a contemporary flair to your bar or dining space with this set of two sleek black leather-look bar stools. The stylish horizontal tufting along the cushioned back and seat is designed for your utmost comfort. The 360 degree swivel seats have a hydraulic manual side lever to smoothly adjust the seat height from 25.5 inches to 31 inches. The track style chrome metal arms and sturdy chrome base with a built in foot rest are designed to keep you and your guests in their seats for many get-togethers. Easy to clean and built to last, with a convenient chrome metal handle bar on the back seat to quickly swing the chair around. 30-inch H Silver Galvanized Metal Café Barstool (2-Piece) A terrific addition to any kitchen counter or breakfast island, this beautiful Monarch Specialties backless bar stool combines top-notch design and durability for a truly timeless piece. You'll appreciate how well its contemporary design fits into any room in your home. Its silver base frame gives a stylish flair to this piece, surprisingly easy to match with other decor. 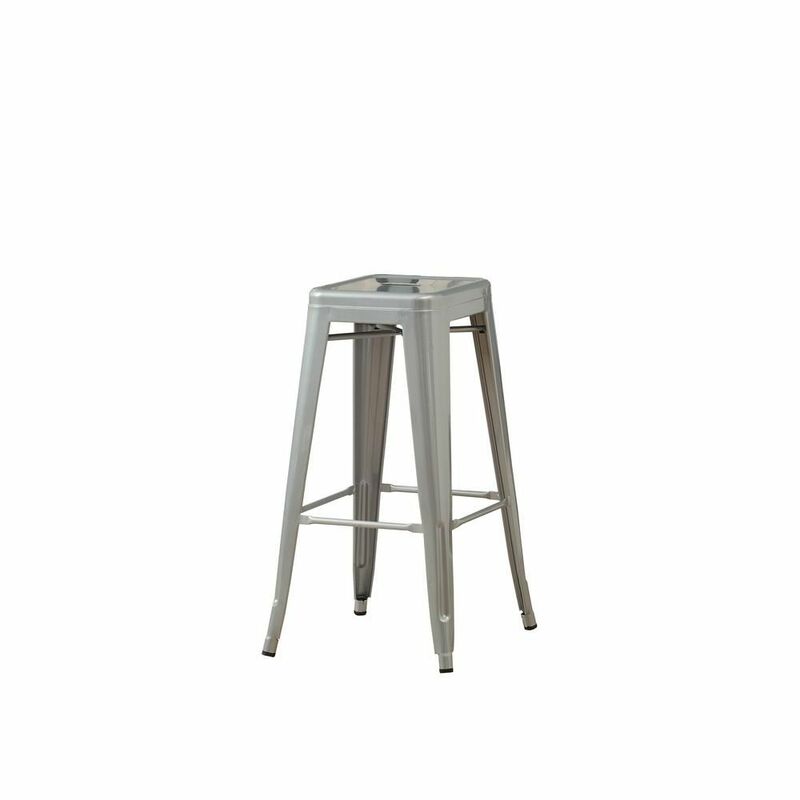 30-inch H Silver Galvanized Metal Café Barstool (2-Piece) is rated 5.0 out of 5 by 1. Rated 5 out of 5 by LA and GB from Practical and sturdy We bought the stools for our cabin and they are exactly what we hoped for. We like the weight and height as they are more heavy duty as well as easy to keep clean.